With Joe Tate on guitar, Willie Riser on Bass and Donny Kountz on drums, the Monday night jam session kicked of with Joe’s rendition of Blue Monday. After delivering a one hour set, Joe Tate, who hosts the session, began calling up the various musicians who had come to play. First up was Craig Caffall and a couple of his friends who burned through a few standard blues numbers. They were then joined by Ken Markowitz who delivered up Stormy Monday along with some others in that bag. Wendy Fitz came with her bassist Tim and performed some very fine old favorite tunes which got the people up off their seats. Jessie Kincaid followed with a fetching rap number that filled the dance floor. This was followed by Gabe Navarre and his smokin hot rock n roll. A very nice trio of singers consisting of David Kemp, Susan Hoffer and Gloria Lopez did some very nice Fleetwood Mac songs followed by Susan Scott singing Fever. Joe Tate finished the night out with some old gospel songs with the trio backing him up. It was a delightful evening filled with friendship, music and good vibes. 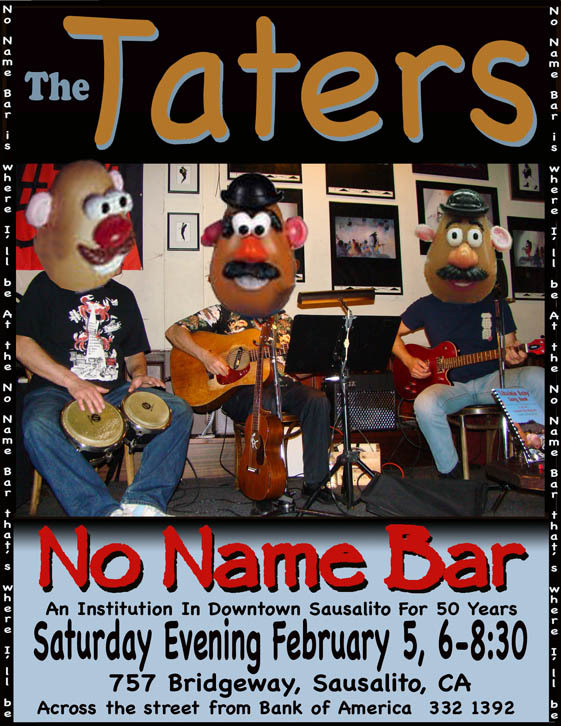 Cole Tate, Joe Tate and Lonnie Walter held forth as the Taters on February 5 at the No Name Bar. Joe and Cole were both called “Taters” when they were in school. Lonnie is referred to as Rotate so, they are all Taters. The house was rockin as usual when these guys team up. With a low key sound using guitars and bongos, it’s never overbearing but good listening that gets the feet tapping. Of course there are always those who get up and dance. We can’t stop them even though there is no dance license. 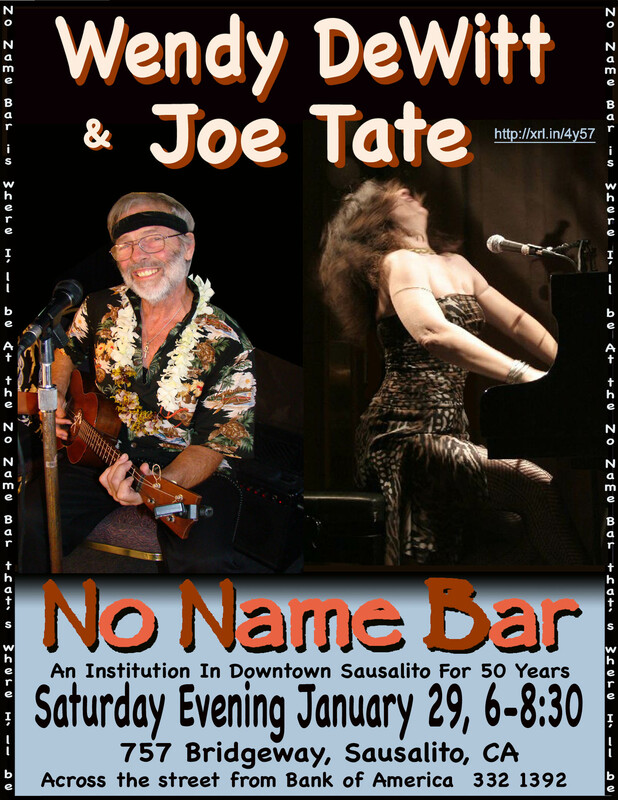 Saturday Jan. 29 was a gas with Wendy DeWitt on piano, Lonnie Walter on bongos and myself on guitar. What a pleasure it is to play with Wendy. Whereas I usually have to sing and hold the middle together, Wendy carried the ball and I only had to diddle around on the guitar. My singing duties were still there but with her dominant left hand, the music rocked with very little effort from me. 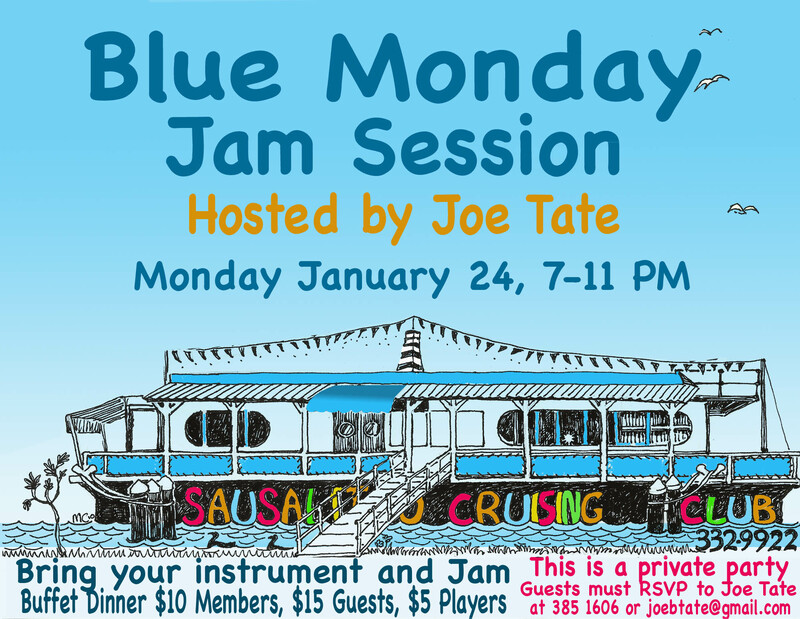 We had another Blue Monday Jam session at the Sausalito Cruising Club last night. This was the first one in a very long time. It used to be hosted by Billy Dunn, a very talented singer and pianist. During his tenure, Blue Mondays were very popular and well attended. After his departure, attendance fell off and it was discontinued. Recently, Blue Monday was being held at the Sausalito Seahorse Restaur.ant but the owner was annoyed with it and he fired the musicians. Taking this as a cue, I arranged to start it up again at SCC. After making arrangements with the Sausalito Cruising Club I hired Willie Riser and Donny Kountz who had been fired. On this our first night, we had a very good crowd, owing to Donna Bragg’s birthday party which was happening there at the same time. Myself along with Donny Kountz and Willie Riser formed the core trio for the jam. 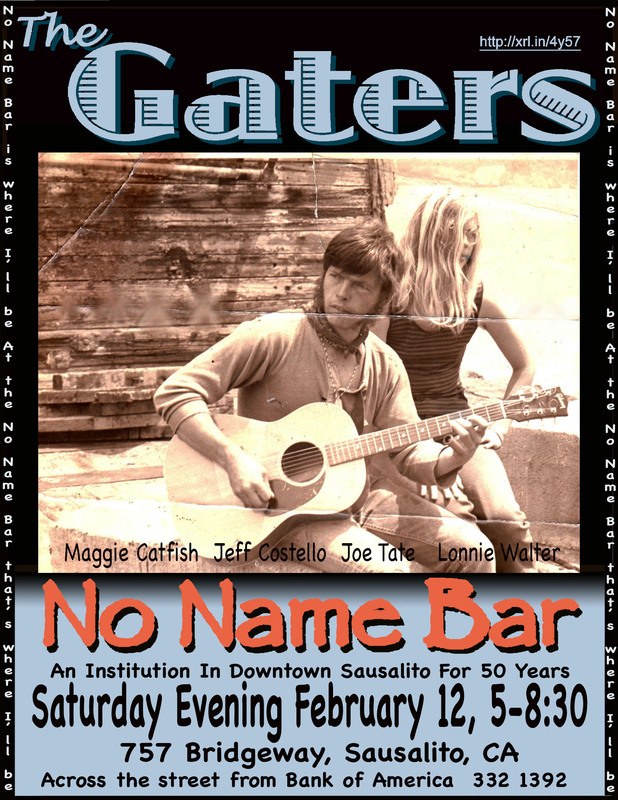 We had several acts contributing to the fun including Tristan Gounard, the Jimmy Buffet Bums, Bonnie Hofka, Jesse Kincaid, Tom Barr, Ray DeFazio and the Daylight Again Trio. After we played some good old songs for an hour, Tristan came to the stage to play his ukulele and sing some Hawaiian songs. This was sort of a relief from our hard driving blues and it was well received. Next the Jimmy Buffet Bums did some JB tunes with very nice harmony. Lonnie walter was there on the bongos giving it a nice Caribbean feel. The room was groovin. Tom Barr assisted on harmonica. Next up was Jesse Kincaid who sang a Beatles number followed by The Midnight Hour and some quasi rap stuff he makes up. People were dancing big time for this. We finally finished up with some call and response numbers with myself on vocals and guitar and the Daylight Again Trio doing the responses. I used to sing with these folks in a group called Tried And True and I had forgotten how much fun it was singing with them. We finished the night with “The Last Time” which is an old spiritual that kinda rocks. 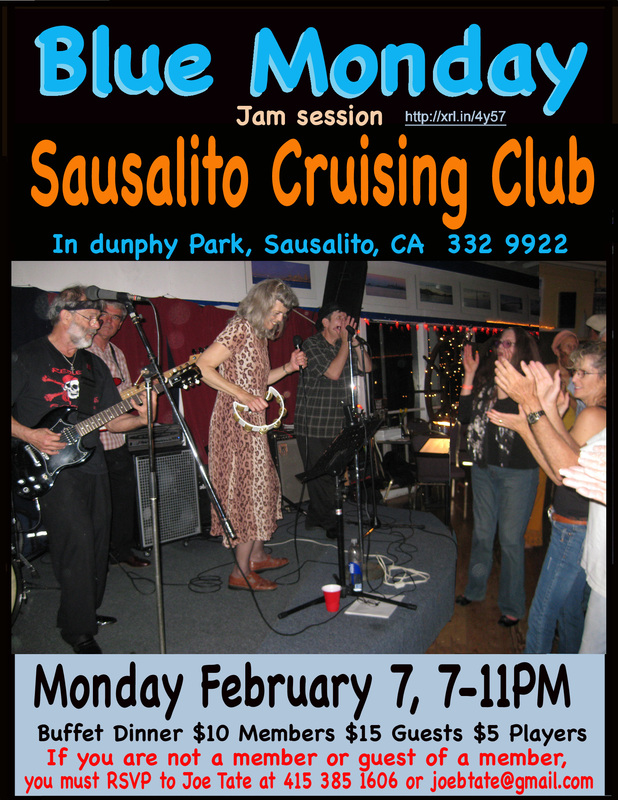 Next Blue Monday at the Sausalito Cruising Club will be on February 7th at 7PM. It is 40 pages and contains 18 songs of varying difficulty. 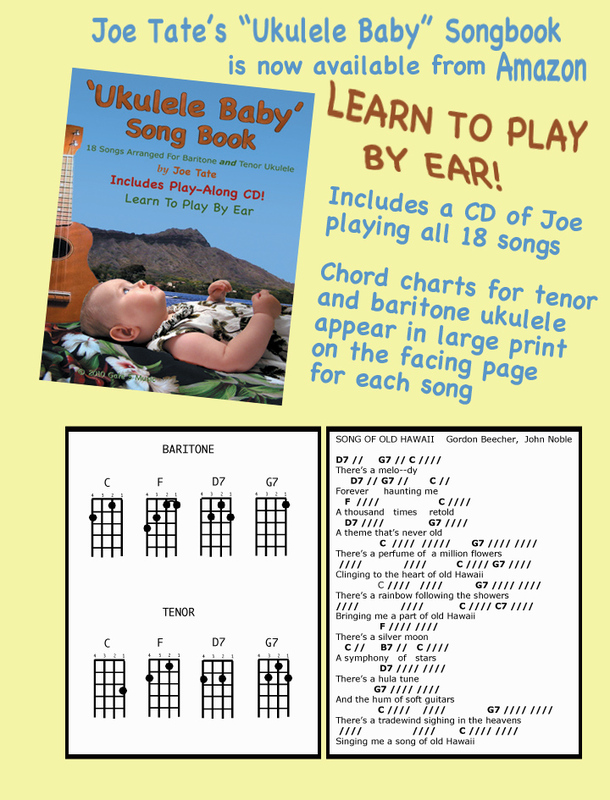 Each song has chord charts for baritone and tenor ukulele on the facing page . The songs are on odd numbered pages and the chord charts are on the even pages. This way the student sees the song arrangement on the right hand page and the chords on the left hand page. A CD is included which has all the songs performed by Joe Tate. My daughter in law was pregnant and she asked me to make a CD of ukulele music to play for the unborn child. I recorded 18 songs which I thought suitable for children. This CD was played often during the pregnancy. After Zoe was born we noticed that she had special responses to ukulele music. If she was crying or upset, a few chords on the ukulele would usually calm her down. 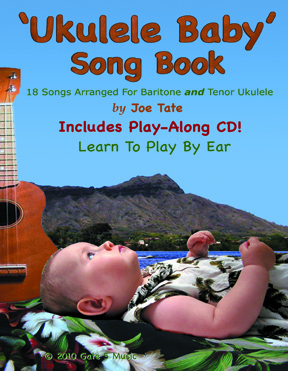 I was laid up for a few months the following year and, while lying in bed with my laptop, I wrote out charts for all the songs and made them into the songbook called Ukulele Baby. Naturally we think of Zoe as the Ukulele Baby. If you want to learn to play, this is a good place to start. The book is simple and easy to understand with emphasis on learning by ear rather than the tedium of standard music decorum.